The Farmer’s Almanac is predicting more rain and tropical storms for Texas and Oklahoma. This is the ideal time to invest in a storm shelter for your home or business. The weather is constantly evolving. A period of dry years will be followed by some stormy ones, which is clearly what we’re moving into now. The Farmer’s Almanac has been tracking weather for decades, making it a popular source for long-term forecasts. The Almanac’s expectations that this summer will see wetter conditions in Texas and Oklahoma should convince everyone that Residential Storm Shelters are a vital safety feature for any home. Basements are a good first step, but they are not designed for protection from weather. 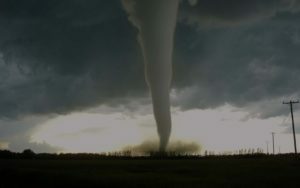 They are vulnerable to collapse of the upper floors, making them very dangerous in tornadoes and hurricanes. In addition, they provide no more security from break-ins than any other part of the house. 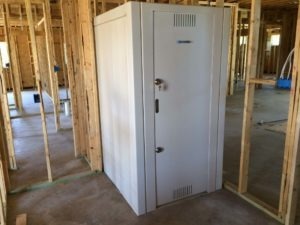 Custom-built Safe Rooms & Storm Shelters provide both forms of protection, with a design that is built for safety first and foremost. The same protection is necessary in businesses so that customers and employees can be protected. A Commercial Custom Storm Shelter & Safe Room will provide that safety for everyone in the business when a tornado unexpectedly spins up during the business day. They only hold true with a well-built unit. Because they are a major investment for the long term, both Residential Storm Shelters and Commercial Custom Storm Shelter & Safe Room products should be designed and assembled for the long haul. The first issue is materials. A quality shelter should be built entirely of steel to withstand the impacts of wind and debris while safely protecting you and your family inside. Wood will splinter or collapse, and concrete blocks can break apart, trapping you under heavy debris. With quality steel construction, you, your family, your co-workers, or your customers will be fully protected from severe weather as well as from intruders. Assembly matters too. The steel components must be properly assembled to keep the structure together during severe weather. That includes the wall and ceiling panels, hinges, bolts, and deadbolts. If the shelter or safe room cannot be securely latched, it does not provide adequate protection. A quality shelter should have a lifetime warranty on workmanship to give you peace of mind. 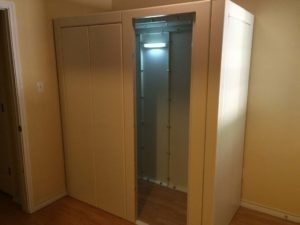 Finally, a good storm shelter must also be customizable for your home. It should be built to fit in the space you have available, whether that is above ground, under a stairwell, or in a closet. The shelter should be accessible at a moment’s notice without being in the way the rest of the time. With such strict guidelines for a safe storm shelter & safe room, it’s clear that the right company is essential for installation. Homeowners and business owners throughout Texas and Oklahoma can contact us for custom storm shelter and safe room. Contact us for more information today!